One of the great features of User Groups is for user group members to be able to share a group email address and send out emails from that address rather than their own. It's a common scenario that a user might need to send out emails from their personal email address, their user email address, but also from one or more generic shared email addresses, e.g. office@, hello@ or smallgroups@. User Groups include this shared email functionality. To add a shared email address to a User Group, click through to the Groups section in the Administrator area and click to Edit the group. In the Email section, enter the From Name and the shared Email address you want group members to be able to send emails from, and an optional email Signature for the user group that will be added to all outbound emails from the user group. The details you enter in the Email section are exactly what will show to email recipients when they receive ChurchSuite emails sent from the user group email address. Finally, review the Users you want to be members of the user group and click the Save Changes button. The User Group's email address must be a valid email address recognised by your email domain host, so that email replies are correctly routed back to your domain host - either to an actual mailbox in your domain, or to an email alias that forwards emails to another email address. Many email domain hosts will allow you to configure mail forwarding to multiple email addresses, so even if you don't want replies delivered to an email inbox, you can have email replies forwarded to one or more other email addresses. 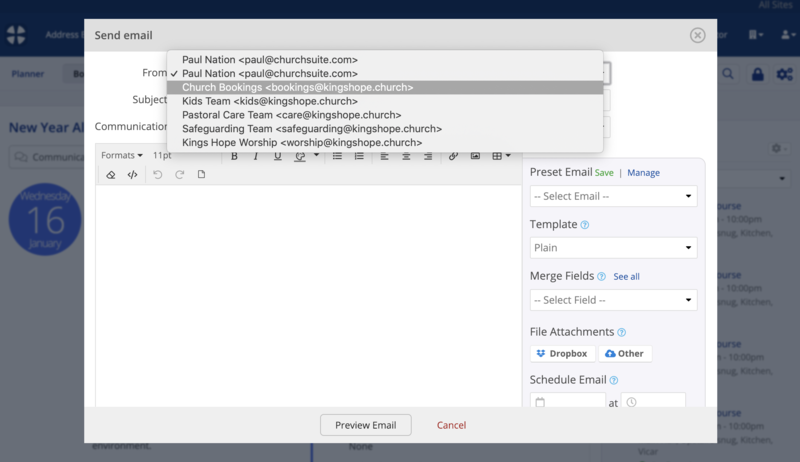 Now, when a User Group member is composing an email within ChurchSuite, they'll be able to select to send From either their user email address (the default, and the first email address in the list), their contact email address (the second email address in the list), or a User Group email address (all the other entires in the list).